"Um... My Love... do we need to talk? Did I do something? Is there something you need to tell me?" asked my dear husband. I was utterly puzzled. As a youth I read this book so many times the binding gave way and the book literally fell apart, and then I lost the pieces. I love this book. Dearly. I hadn't read it in years, though I'd been scanning Amazon (and Alibris, BN, and EBay) for it almost monthly during all that time. It's out of print, you see, and though the original cover price was $0.85, it now sells for $75-$450. Sure, I wanted to read it again, but I could never justify $75 for a "poor condition" copy which might fall apart again or $450 for a "like new 1st edition" copy. That's just extortion! Last month, there happened to be a "like new 1st edition" copy for $25 (obviously sold by someone who didn't know its value)! I bought it. 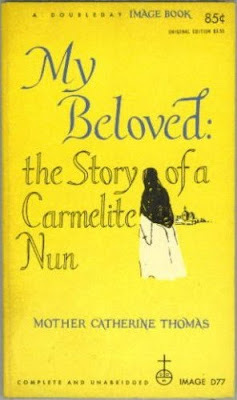 Then there's another book I highly recommend by Alice von Hildebrand entitled By Love Refined, Letters to a Young Bride. It's good for any wife, I love love love it. It does have an unfortunate heading on the back cover, though. I will have to check out those books. I love book recommendations. Somehow, I came upon your blog, and I am enjoying my visit here. After reading this blog entry I decided to read "Beloved". I inter-library loaned it. I was a wonderful read. My mom is currently reading it. I can see why it made you want to be a nun. I wish it was still in print too. Yay! Isn't it a delightful little book? I wish every young Catholic girl would read it :).